It’s February 11th. What does that mean? Beware of SPOILERS beyond the jump. Quick little recap of the first half’s season finale. Rick along with Michonne and a few others invade Woodbury to rescue Glenn and Maggie, although they lose Oscar and Daryl ends up being captured. Michonne, who had gone off by herself after leading Rick to Woodbury, attacks and blinds one of the Governor’s eye. Tyrese and his group are being held in the communal area of the prison while everyone waits for Rick to return. And the last episode ends with the Governor riling up the town into a fervor and setting Daryl and Merle against each other. “The Suicide King” starts back at Woodbury with Merle and Daryl fighting each other to survive, but it is a short ruse because before they try to fight their way out Rick and Maggie come back to save them. This opening sequence seems so rushed and I did not feel like I had the best sense of what was going on. And what was the point of Andrea staying behind even though any sensible person would try to reconnect with people they actually fell safe with, which will go to something else in a minute? 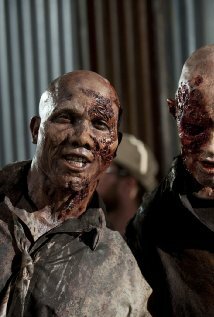 The opening scene was very lackluster, although we do see a hole for walkers to enter Woodbury. 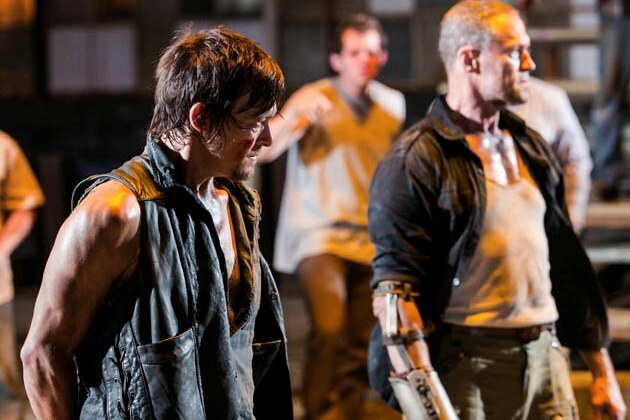 The actual drama begins as Rick and Maggie return with the Dixon brothers. Of course everyone would be upset with Merle coming along with what he did to Glenn and Michonne, but Daryl sticks up for him. In a world in chaos; no matter how bad your blood is, they are still your one true connection in the world. So the choice must be made: no Merle, no Daryl. It isn’t hard to see why Rick decides to let Daryl go, but it would definitely made the prison an even more interesting place. Even without the problem with Merle, the prison is still a hotbed of trouble. Ben and Allen, from Tyrese’s group, share the idea that they are willing to kill a cripple and children to secure a home for themselves. Is that is not enough, Glenn’s honeymoon with Maggie is over because of the events at Woodbury (even if it feels completely forced especially how they treated each other before the break). Glenn has continued to increase his character’s importance to the show by growing a little more vicious and aggressive, as he flips out on just about everybody. I’m really glad that Glenn has developed past a glorified gopher. But as for characters that continue to fail to grow, Andrea decides to help Woodbury. After finding out that Maggie and Glenn were being kept, the Governor’s dead heart that would force men fight for their lives, and the town does not have a redeeming citizen within; she decides to stay and help encourage the community. It is really sad that her character continues to be nothing but a lamb that sparks the catalyst for events but takes no real action. Then there is the finale. In the words of my brother, “Holy balls!” As Tyrese pleads his case to stay in the prison, Rick begins to see ghost-zombie Lori on a walkway. Rick begins to show his character is truly breaking down under the stress of losing people and leadership. Tyrese could not have picked a worse time to try to ask a favor of Rick. “The Suicide King” was an alright episode. It does not feel like an episode in the middle of the season, it feels like the start of a brand new season which may be one of the downsides to the two-part season. The development of characters (especially that of Rick, Glenn, and even the Governor) keep me interested in how these characters will turn out as the season continues. Even with great fan service moments (Daryl taking back his crossbow, Glenn curb stomping the zombie sans curb), this episode leaves a lot to be desired. “The Suicide King” is all about developing a few characters, but it sacrifices the storytelling. Even though this episode is halfway though season 3, it felt like the season premiere of season 3.5. I think Glen is going to start taking more ownership and leadership role within the group. I don’t think we’ve seen the last of the foursome that was at the prison. I also believe Carl is going to start taking charge more especially once he starts getting older. Beware of Merle coming back as well. It’s very interesting watching the development of the characters.